If you love the look of beautiful, deep red garnet gemstones paired with a cool white gold, then this garnet "V" ring in 14K white gold from Apples of Gold Jewelry is perfect for you. Available in your choice of 10K, 14K, or 18K white gold, there are 28 garnets going around the front and sides of this ring. The pinpoint set authentic garnets are AA rated stones that offer plenty of style to this lovely band ring, which has a "v" shape in the front and center. Perfect for stacking or pairing with other jewelry pieces, this ring can also be worn on its own for a smaller statement piece. 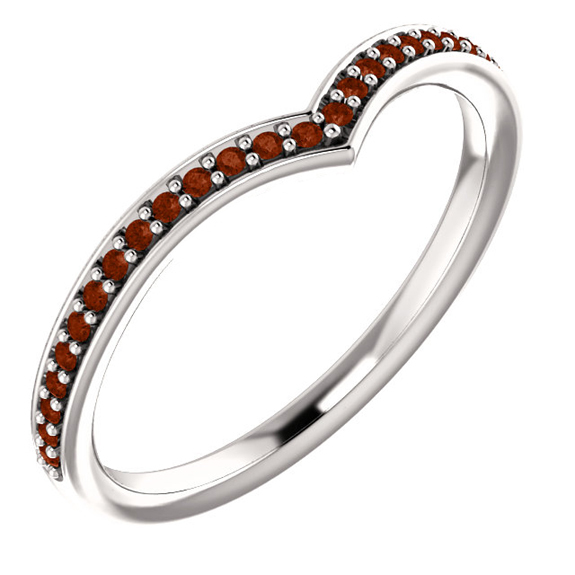 We guarantee our Garnet "V" Ring in 14K White Gold to be high quality, authentic jewelry, as described above.